YouTube Rewind 2016 is YouTube’s celebration of the videos, people, music and dance moves that made 2016. Shot in London, Tokyo, Mexico City, Los Angeles, the YouTube Rewind 2016 video brought together over 200 creators, viral stars, and celebrities to sing, dance, and laugh their way through Rewind’s biggest celebration ever. Dwayne “The Rock” Johnson kicks off the 6:52 minute video, with Justin Bieber’s “Sorry” and Chainsmoker’s “Closer” and Zay Hilfigerrr and Zayion McCall’s “Juju On That Beat” serve as backdrops for a celebration of popular culture, including Niantic’s Pokemon Go, Pikotaro’s Pen Pineapple Apple Pen (PPAP), Dude Perfect’s Water Bottle Flip, Street Fighter eFight tournaments, James Corden’s Carpool Karaoke, the Mannequin Challenge, Orbeez, Game of Thrones Hold The Door scene, rainbow colored bagel, the 2016 Olympics, (fingernail) polish mountain, Scott Sterling’s volleyball face, Fifth Harmony’s Work from Home, Hydraulic Press channel, and Kanye Wests controversial “Famous” music video. Let’s Plays, King Imprint’s dance moves, The Ultimate 2016 Challenge is hosted at rewind2016.withyoutube.com with visual references to YouTube creators and stars, videos and trends from 2016, a set of 22 Easter Eggs, 360 degree videos, and a quiz on pop culture in 2016. Published on December 7, 2016, the Youtube Rewind 2016 video has now had over 176 million views. ¡Tu Puedes Bailar Así Como HolaSoyGerman! Do Pandas Dream of Electric Sheep? 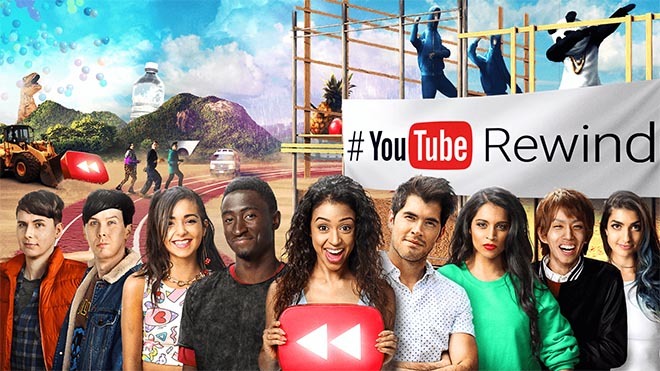 YouTube Rewind 2016 was produced by Portal A Interactive, with director Kai Hasson, lead editor Arturo Morales, director of photography Alex Jacobs, film directors Morgan Wise and Lex Halaby, and head of production Finley Wise. Visual Effects were produced at Cinesaurus by On-set VFX supervisor Gabe Conroy, lead VFX artist Gabe Conroy, VFX team David Hudson, David Zimmermann, Steven Hudson, VFX artist and designer Ebae Kim. Roto and rig removal was done at Ablaze VFX. Music was mixed by The Hood Internet (Aaron Brink and Steve Reidell), with an original remix by Major Lazer.